Hello all, my name is Pixel. I’ve been into scale vehicles in one way or another for most of my life. I built scale models when I was a kid, though that petered out when I got my driver’s license and could start playing with the real thing. I’ve always had at least a couple 1/18 diecasts around the place since then. I was only ever passable at building models, and tended to want to keep messing with them, or playing with them which resulted in a lot of broken models. So when I found the line of Bruder 1/16 toy trucks I decided if I was gong to treat them like toys, I may as well collect toys. I’ve been collecting a lot of 1/16 trucks, with the vague plan of building/modifying them into a fleet of working tow-trucks so I can live out my tow-driver dreams on the floor of my nice warm living room. Modifications are likely to be slow though with most of my time & money going to my 50+ year old truck and 120+ year old house. But you’re here for the toys. Despite my talking about the Bruder trucks, the first ones I’m reviewing here are from Ertl’s “Big farm” line of 1/16 toys. These are decidedly toys, with non-opening doors and a big hole in the roof to let you put figures in the seats, but still have some really nice detailing. 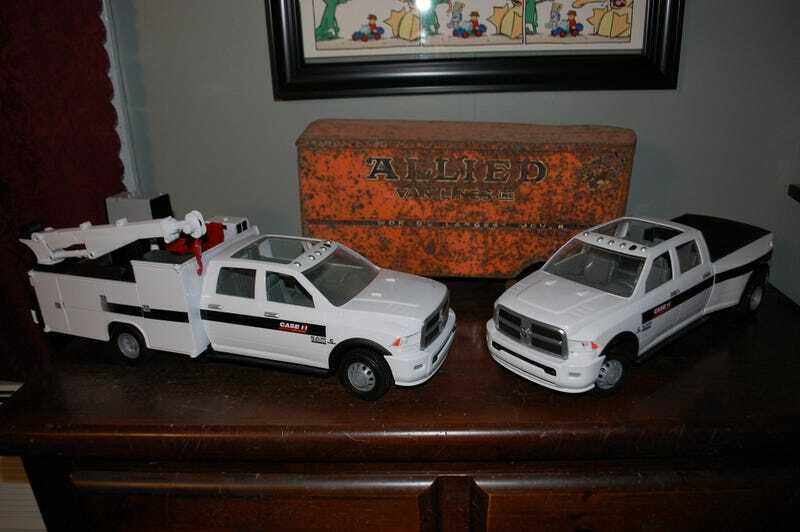 They are both licensed 2015 Ram 3500s, and capture the look of the truck really well. These are logoed as Case IH dealer trucks, which I chose as less intrusive then the huge “BIG FARM” logo on the generic ones. The vents on the hood are buttons, one turns on the lights and honks the horn, the other plays an ridiculously long and awful sound clip of a big diesel starting & reving as filtered through a tiny piezo speaker with no bass. Aside from the sound chip, the only “play” elements of the pickup are a working tailgate & steerable front wheels. The interior is nicely detailed though, and some paint here will go a long way to making it pop. The one that caught my eye though and caused me to buy both trucks was the service truck version however. It is just like the sort of trucks you’d expect to see doing on-site heavy equipment repairs, or roadside heavy truck repairs. Complete with fluid tanks, generator, welder, & service crane. And as for play features, how about this? This think is nuts. I just kept finding more things to mess with. All four vertical doors on the bed open, the tailgate lowers, the stabilizer jacks lower, the tank comes out & the welder detaches. And the crane rotates, the boom extends and the winch works(the winch is contained in the head, so it has a very small load capability). When I was a kid I would have nearly wet myself with glee if I got this thing. The long term plan is to re-logo both in to my eventual fake tow company, and build a working wrecker bed for the pickup using a 1/10 R/C scale winch. Assuming there is any interest I’ll do more of these reviews, and can start actually showing off the Bruder trucks I talk so much about.